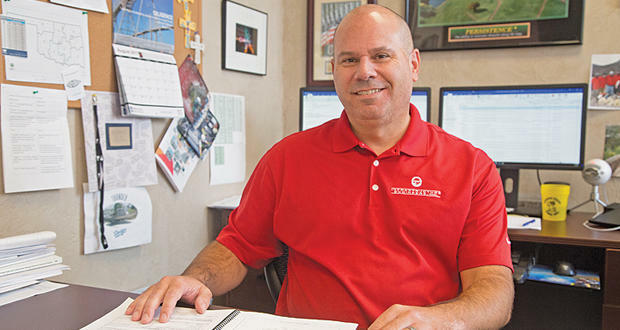 Gregg Hostetler, vice president of Infrastructure Engineers Inc. based in Edmond. New software will help engineers at the Oklahoma Department of Transformation determine which bridges require inspection after an earthquake. Journal Record editor Ted Streuli talks with KGOU's Jacob McCleland. The ShakeCast software will allow engineers to focus their efforts on structures that are most likely to be damaged by an earthquake. The Journal Record’s Brian Brus reports that each bridge is unique in its age, materials and design, and it doesn’t make to send engineers across the state to insect bridges if damage is unlikely. Two of the state’s largest geological events had little structural impact – in 2011, a 5.6 magnitude earthquake near Prague caused minor damage to highway pavement, and only cosmetic damage was found in 2016 after a 5.8 magnitude quake at Pawnee. By comparison, ODOT engineers had to visually inspect all bridges within 5 miles of any earthquake epicenter beginning at magnitudes of 4.4. After the Prague earthquake, ODOT’s old bridge protocol required the inspection of 700 bridges. Very little damage was found. If ShakeCast were in use at the time, only 35 bridges would have been inspected. Before 2008, the average rate of earthquake recordings in Oklahoma was only two of magnitude 3.0 or greater per year. That number rose to 20 the following year and 43 in 2010. By 2015, the number reached 887, according to the USGS. Journal Record editor Ted Streuli told KGOU the state has spent about $650,000 on ShakeCast over the first two years. “After the Prague event the department had to inspect about 700 bridges in person. And so that’s a lot of money too. If they’d had this software at the time they would have only had to inspect about 35 bridges. That’s only about 5 percent of what they went out and did. So it could save them a great deal of money,” Streuli said. McCleland: Ted, when there’s an earthquake in Oklahoma, what do engineers at the Department of Transportation have to do? McCleland: What kind of damage have earthquakes caused to roads and bridges here in the state? Streuli: Not very much. The biggest earthquake, the one in Prague, caused some minor roadway damage and the other really big one, that was up by Pawnee, caused a bit of cosmetic damage but no structural integrity problems at all. McCleland: Well let’s talk a little about that ShakeCast software. What does it software do to help engineers? Streuli: It helps them decide which bridges really need an in-person inspection after an earthquake, and it does that by comparing structural data about all of the bridges in the state to the severity and proximity of that particular temblor. McCleland: Is this software more accurate that simply sending somebody out to make visual observations of damage? Streuli: No, it’s not more accurate necessarily, but that’s not really what it’s designed to do, either. It only tells ODOT which bridges have a high enough probability of structural damage that a human inspection is warranted. McCleland: ShakeCast isn’t cheap software. But on the other hand, it sounds like ODOT is saving a lot of man-hours for labor. Does the software save the state money in the long run? Streuli: The software has cost the state about $650,000 over the first two years, but if you consider that after the Prague event the department had to inspect about 700 bridges in person. And so that’s a lot of money too. If they’d had this software at the time they would have only had to inspect about 35 bridges. That’s only about 5 percent of what they went out and did. So it could save them a great deal of money. McCleland: Let’s talk a little now about the Corporation Commission. Governor Mary Fallin issued an executive order this week to create a task force that will examine the commission. This is a public body that regulates two of the state’s largest industries - energy and telecommunications. Why does Fallin want to give the Corporation Commission a long, hard look? McCleland: Your reporter Sarah Terry-Cobo reports the legislature has cut the Corporation Commission’s budget by millions of dollars in recent years. The legislature has also given the commission more to do, like regulating ride-hailing services. Is this part of the reason the governor wants to possibly change its structure? To make sure the commission can feasibly do what it’s supposed to do? Streuli: Yes, absolutely. The commission oversees a lot of businesses and it’s possible they’re under too much pressure with too few resources. McCleland: How have members of the commission reacted to this executive order? McCleland: When will the tax force’s recommendations be made public? Streuli: They’re supposed to be finished by the fall of 2018, so somewhere right around there.